These PVA Instant Cooling Towel make it easier to beats the summer heat. You can achieve a 20 degree cooling effect and wick away the sweat with it. At 32x13in they will fit around your neck just perfect and are Non-toxic as well as Machine Washable! Oma loves to take the Forever Cool Instant Cooling Towel with her on hikes. I simply re-wet them, ring out the excess water and then snap the towel a couple of times to re-charge the towels cooling effect – they come in very handy. You can choose from a pretty pink or blue. I love that you can put it back into the plastic container for easy storage. 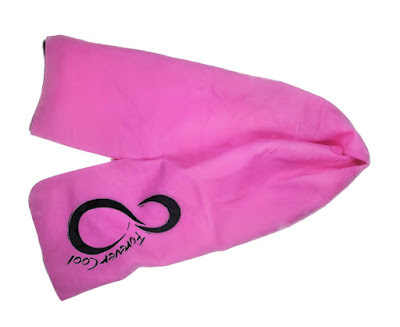 Introducing the Forever Cool Instant Cooling Towel- an innovative new product developed by Live Infinitely. Our Yoga towel instantly lowers the temperature of your skin. Quickly feel the dramatic difference as it cools you off. Soon it will be the only thing you reach for when needing to cool down, help with those pesky migraines, when doing yard work or just about anything in between. Pink Sports Towel Variation ✦ Extremely easy and friendly to use, simply soak in water, ring away excess, snap towel a few times and allow the cooling towel to do the rest. To recharge the cooling effect just re wet and re snap towel. ✦ Unique eco friendly PVA material absorbs the water and as it evaporates provides a welcome cooling effect. The extremely absorbent towel remains soft and supple throughout its use while cooling for nearly 4 hours! ✦ Evaporative material remains dry to the touch the entire time it is in use allowing for numerous potential uses. Recommend for use as a fitness, camping, swimming or sports towel and is perfect for anyone working outside. Not only provides a nearly 30 degree cooling effect but also UPF 45 sunscreen protection. ✦ Durable, reusable and machine washable to ensure that your cooling towel will be with you all summer long. 100% Money back guarantee so if you're not happy we will refund your purchase and let you keep our FREE fitness eBook that's included in every purchase! ✦ Comes in an anti-bacterial carrying case. Give it a risk free trial for yourself.